The Chancellor of the Exchequer, Philip Hammond, announced a string of measures to bolster the UK’s FinTech industry this week, including a new cryptocurrency taskforce to both regulate and support crypto technologies. Hammond also revealed a new "FinTech bridge" to Australia, following existing links with Singapore, China, Korea, and Hong Kong. In other news, UK FinTech firms expect 88 per cent growth over the next three years, according to a survey by the London Stock Exchange Group and TheCityUK. 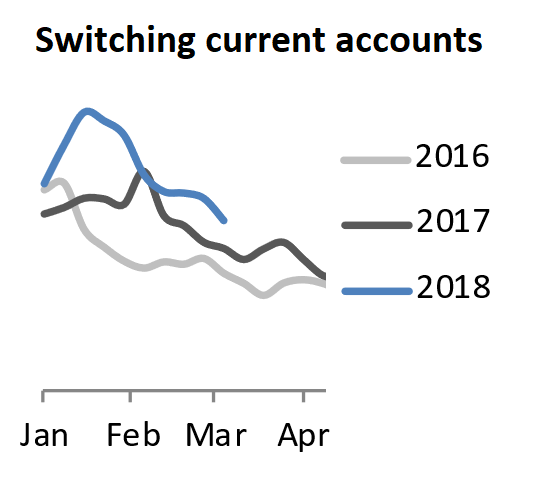 So far in 2018, the number of customers searching to switch their current account has been noticeably above 2016 and 2017 levels – are we seeing the impact of Digital Banking on the sector? GDPR - 9 weeks to go!